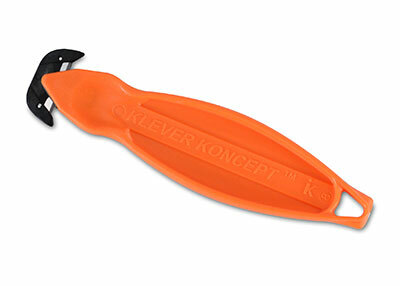 Lightweight cutter with curved shape and increased handle size for ergonomic ease of use. Large blade openings makes cutting thicker materials easy. Recessed dual carbon steel blades reduce risk of injury. Cardboard-piercing safety guard prevents damage to carton contents when opening. Tape splitter makes opening boxes quick and efficient.